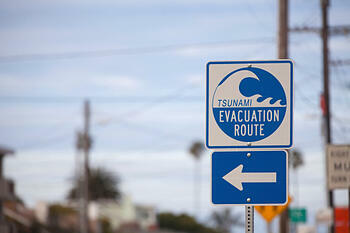 In December 2004, a tsunami devastated coastlines throughout southeast Asia, especially those in Thailand. Coverage of this tragedy that took thousands of lives focused on the fact that because the killer wave caught so many people by surprise no one in its path had time to avoid its wrath. It might surprise you to learn that the Moken, a small group of nomadic "sea gypsies," escaped the tsunami's path. How? According to anthropologist Jacques Ivanoff, and as reported in National Geographic, "They read nature's signals: the silence, the receding of the water, the color of the sea, the strong current. They have collective memory of the multiple rolls of a tsunami. They knew the second wave was the killer, so they had time to escape before it came." When they realized what was happening, they escaped to higher ground. While their communities (located in Myanmar and Thailand) were consumed by the tsunami, the vast majority of them avoided the same fate. Indeed, only one Moken was reported to have died, a paralyzed man unable to flee to higher ground. The Moken were able to focus on what mattered most to their survival. That focus came from a form of self-awareness shared among them. Most people think of self-awareness as an internal awareness of feelings, emotions, and a sense of who you are. And it is. But as Daniel Goleman points out in Focus: The Hidden Driver of Excellence, self-awareness is most fully developed when we are connected to other individuals (e.g. being able to sense and read others' emotions) and our communities and environments. That's because these connections create a feedback loop. When we are connected to others, we can sense how they see us and can use that information to better ourselves. If, for example, others see you as being too emotional, or not emotional enough, you can use that information to alter how you interact with others. When we're connected to our communities and environments, we can sense our place in them and effect on them, and also use those connections to better ourselves. The Moken's shared sense of community and connection to their environment saved them. They didn't have to convince anyone to flee. They read the signs and took swift action almost as if they were one person. This is the kind of self-awareness fathers need to be fully involved in the lives of their children. It's the kind self-awareness we teach in our 24/7 Dad® and InsideOut Dad® programs. This kind of self-awareness is what dads need to focus on what matters most to better themselves as men, partners/husbands, and fathers. Fathers learn to connect with who they are, where they come from, and how to understand and handle their feelings and emotions. They learn to better themselves as men and fathers by connecting to how how their children and mothers of their children/wives see them. They learn that being a great dad isn't just about their relationships with their children and mothers of their children/wives. They must also have a positive impact on their communities and environments. What have you done today to better yourself and focus on what matters most to your children? How are you becoming a more self-aware dad?